Finding truth is an art we learned and willingly unlearned. Truth may strictly be found by looking for the facts, to independently confirm- and prove our ideas. Independence needs dualism, which is difficult to practice in personal- and social settings, because invariably, power and politics (or post-modern dialectics) convert 'seeking independent confirmation' into 'avoiding dependent rejection'. Truth and ethics change ideas to fit the facts, whereas power and politics change facts to fit the ideas. After Kant, this post-modern philosophical monism seized modern philosophical dualism. The present article aims to resume modern dualism, finding antecedents in spatiotemporality and consequents in social interaction, to unmask post-modern celebrations of power and politics, in all traumatizing manifestations. When Immanuel Kant preeminently articulated modern philosophy (Rohlf 2016), post-modern philosophy was an accident waiting to happen, to proclaim that the two sources or 'duality of origin' (Bergson 1932), are one − in monism. At the arrival of the French Revolution, Kant put the Anglo-Saxon 'synthetic a posteriori' ('sensibility after-the-fact') and the Continental 'analytic a priori' ('understanding before-the-fact') side by side, into the 'synthetic a priori' ('sensibility before-the-fact'), to imply that sensibility independently confirms understanding. The knowing subject ('phe-noumenon') submits to the sensed object ('noumenon'), to find truth between subjects inter-subjectively referring to it. Hegel – on the contrary – then claimed the object submits to the subject!! Celebrating power and politics, subjects inter-subjectively 're-cognize' and dependently confirm each other, independently rejecting enemies. "The subject goes into the world and loses himself, or he goes into himself and loses the world" (Hegel 1807). Morality changed from equanimity by the object and the subject, to the impact from two subjects, one clearly dominating the rest (Harré 1972). Post-modern deconstructionism (Žižek 2012, Derrida 1992) claims that existence is nothingness (Heidegger 1959, Sartre 1943), God is dead (Nietzsche 1882), truth is multiplicit or dialectical (Marx 1867), and reality is only a mental phenomenon without an independent object (Hegel 1807). Proclaiming Kant the 'Copernicus of the Philosophical Revolution', for calling space and time 'basic categories' of the phe-noumenon or subject, masked losing his independent noumenon or sensible object, to keep the dominating phe-noumenon or knowing subject. One and a half centuries after the French Revolution (1789-1799), the Cultural Revolution (May 1968) doubled down on the monistic premise. Defending its banished open- and dynamic dualism (Bergson 1932), monism deflects to closed- and static dogmatism of power and politics, group-polarization (Moscovici 1969, Meertens 1980 2006), or dialectics to dominate or submit. Post-modern monism or (phe-)noumenalism within-groups-between-people and/or within-people-between-groups, surmounted modern dualism or (phe-)noumenology within-ideas-between-facts and/or within-facts-between-ideas. Dividing between 'synthetic a posteriori sensibility' in space, and 'analytic a priori understanding' in time, Kant implied that modern dualism of sensibility and understanding is dualism of space and time (1781: 78-105). Sensibility relates 'sensing' to 'what-is-sensed' in space and understanding relates 'knowing' to 'what-is-known' in time. The object, or environment/other/reality, is 'what-is-sensed' as source space and 'what-is-known' as self-reflected time. The subject, or organism/self/belief, is 'sensing' as self-reflected space and 'knowing' as source time. Recollection is 'what-is-sensed' as source space and 'sensing' as self-reflected space. Construction is 'knowing' as source time and 'what-is-known' as self-reflecting time. Spatiotemporal spheres are 'what-is-sensed' as source space and 'sensing' as self-reflected space, plus 'knowing' as source time and 'what-is-know' as self-reflected time, recollecting content and behavior from the periphery to the depth, in space, or constructing form and consciousness from the depth to the periphery, in time. Source spheres co-ordinate with their self-reflections, and regularly co-incide with the self-reflection of the opposite source. Sensibility and understanding, in Descartes' and Kant's dualism, have antecedents in spatiotemporality and consequents in social interaction. 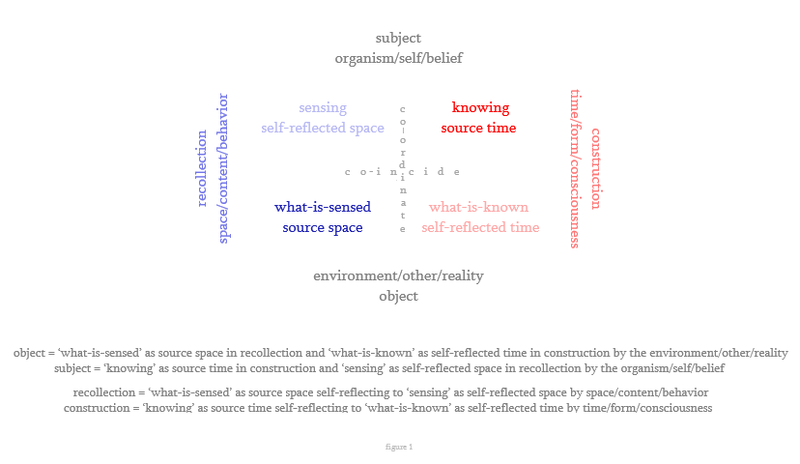 In Chapter 1, "Co-ordinated Co-incidence", space and time separate into 'what-is-sensed' as source space in the object, and 'sensing' as self-reflection in the subject, co-ordinated by recollection, plus 'knowing' as source time in the subject, and 'what-is-known' as self-reflection in the object, co-ordinated by construction. 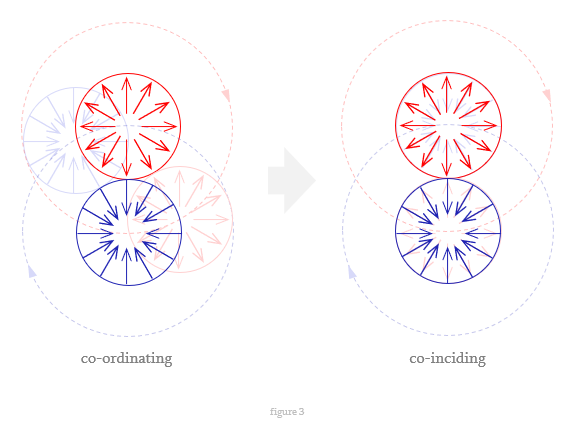 Co-ordination is copied-and-swapped into co-incidence at peripheries and depths of spatiotemporal spheres. In Chapter 2, "Independent Confirmation", between the co-incided spheres in the object and subject, allows the object's spheres to copy-and-swap the subject's spheres, to extend substances of recollection and construction, from one sphere to the next, within- and between subject and object. In Chapter 3, "Constructive Recollection", object and subject are other and self, in 3a "Science", 3b "Justice", 3c "Journalism". 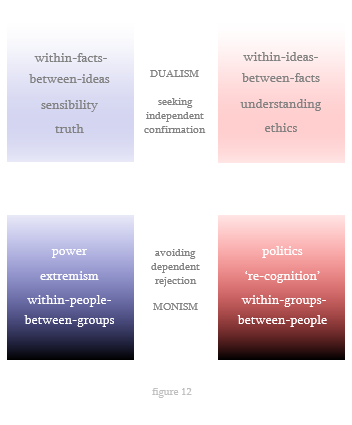 Dualism consists of states, stages and phases of an objective- and a subjective cycle for each interaction, as they compare and contrast within the effects of monism on post-modern society. According to physics, space and time are near identical in the monistic concept of 'spatiotemporality'. Relativity theory tells us, that speed and acceleration of objects curve space and slow time, warping spatiotemporality around Euclidean spheres. However, the periphery's three spatial-, and the radius' one temporal dimension of a sphere, are dualistically irreducible to each other, as their ratio π ("pi") has infinitely many non-repetitive decimal places. 'What-is-sensed' or source space at the periphery resembles Cartesian "res extensa" ("extended substance"), while 'knowing' or source time at the depth resembles "res cogitans" (Descartes 1644). Because "duality of origin" has co-incided space and time, spatiotemporal dualism in the environment/other/reality also exists in the organism/self/belief (De Weijze 2017). From the outside, 'sensing' as reflected space is a part of 'what-is-sensed' as source space, in recollection, and from the inside, 'knowing' as source time "ob-jects" or "throws-off" 'what-is-known' as reflected time, in construction. As a consequence, sensibility is reflected at the peripheries of the spheres, whereas understanding is reflected at the depths. At peripheries, sources are spatial, to objectively recollect material- or causal items, self-reflected in the subject. At depths, sources are temporal, to subjectively construct immaterial- or teleological items, self-reflected in the object. In recollection temporalizing space ends, as in construction spatializing time starts, at depths in time/form/consciousness. In construction spatializing time ends, as in recollection temporalizing space starts at the peripheries in space/content/behavior. The object manages to co-incide 'what-is-sensed' as "empty" source space and 'what-is-known' as spatialized, self-reflected time. The subject manages to co-incide 'knowing' as "blind" source time and 'sensing' as temporalized, self-reflected space. As Kant puts it, "thoughts without contents are empty and intuitions without conceptions are blind" (1790). Space/content/behavior from peripheries of 'what-is-sensed' as source space, co-incided with 'what-is-known' as spatialized, self-reflected time in the object, is through copying-and-swapping, by time/form/consciousness, at depths of 'knowing' as source time, co-incided with 'sensing' as temporalized, self-reflected space in the subject. A source consists of pure or source space, at its periphery, or of pure or source time, at its depths. Self-reflective space moves to source time in recollection, and self-reflective time moves to source space in construction, with a reflection point at co-incidence, both in the source and in the self-reflection. If space is 90% and time is 10%, or space is 10% and time is 90%, in recollection or construction, together they make spatiotemporality possible. In between recollection and construction, there exists a copy-and-swap of states, stages and phases, from the state of recollection to the state of construction, or from the state of construction to the state of recollection. This is why at the periphery, source space, and at the depth, source time, facilitate the transfer, and why the object is 'empty', and the subject is 'blind'. Space/content/behavior from the peripheries to the depth of the spheres, in recollection, continue to increase, as well as time/form/consciousness from the depth to the peripheries of the spheres, in construction, continue to increase likewise, until the other side takes over. The exercise is like breathing in by recollection, and breathing out by construction. Object and subject both make spatiotemporality, one recollecting, and the other constructing. The object, in recollection, is 'what-is-sensed' as source space, and in construction, is 'what-is-known' as self-reflected time. The subject, in recollection, is 'sensing' as self-reflected space, and in construction, is 'knowing' as source time. During co-incidence, from the self-reflections of their opposite sources, the object adds 'what-is-known' as self-reflected time, and the subject adds 'sensing' as self-reflected space. As object and subject create spatiotemporality, the one adds content to form, while the other adds form to content, or the one adds behavior to consciousness, while the other adds consciousness to behavior. Between- and within object and subject, copy-and-swap adds items of recollection, space, content, and behavior, to the items of construction, time, form, and consciousness. Both extensions of recollection or construction remain the same, even though the other is involved. Recollection and construction have states, stages and phases, and in recollection, people sense, realize, value, and react, while in construction, people know, intuit, try, and act. Kant's basics are found in self-reflected sources, 'sensing' as self-reflected space, and 'what-is-known' as self-reflective time. At co-ordinated spheres of sources and self-reflections, peripheries support space/content/behavior and depth time/form/consciousness. From recollection's peripheries, 'what-is-sensed' as source space and 'sensing' as self-reflected space, reduces space in time, to co-incide with depth of construction, 'knowing' as source time and 'what-is-known' as self-reflected time, before construction takes over. Recollection ends and construction starts, reducing time in space, from 'knowing' as source time to 'what-is-sensed' as source space. Temporalizing space allows content-shaping-form and behavior to internalize as consciousness, like spatializing time allows form-shaping-content and consciousness to externalize as behavior. Copy-and-swap grows, shaping- and being shaped by form, like behavior, internalizing as- and being externalized by consciousness. Our behavior dissolves in consciousness as the subject 'reacts' in response to the object's 'action', as consciousness dissolves in behavior if the subject 'acts' in response to its own 'reaction'. At co-inciding spheres peripheries, where space/content/behavior are 'what-is-sensed' as source space, and 'what-is-known' as self-reflected time, and at spheres depths as time/form/consciousness are 'knowing' as source time, and 'sensing' as self-reflected space. Object and subject reconstitute "here" in space and "now" in time, fact and idea in content and form, and behavior and consciousness in our material basis and immaterial orientation (De Weijze 1982). The first step in copy-and-swap is co-ordinated co-incidence, as they go from one sphere to the other, between- or within object and subject, across peripheries between them, or through depth within them. Construction in one sphere continues as recollection in the next, by co-ordination between object and subject, and by co-incidence within object and subject. Current content is conveyed from periphery to depth, along temporalizing space in recollection, and from depth to periphery, along spatializing time in construction. 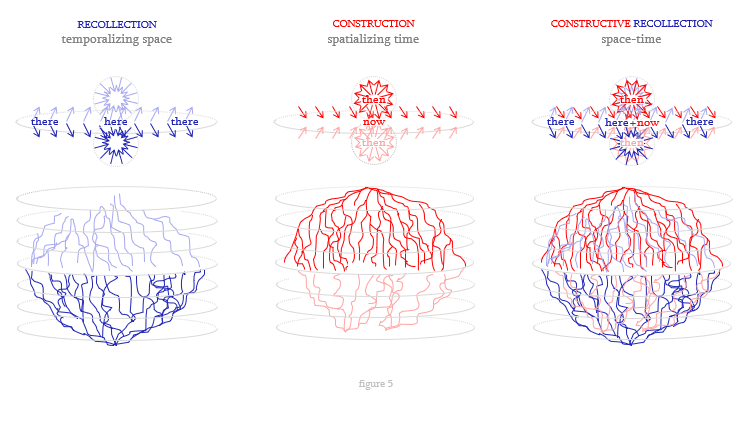 Temporalizing space internalizes behavioral content-shaping-form, as consciousness, while spatializing time externalizes consciousness form-shaping-content, as behavior. Memory is increasing, when co-ordinated recollection or 'what-is-sensed' as source space and 'sensing' as self-reflected space, make contact with construction or 'knowing' as source time and 'what-is-known' as self-reflected time. First, there is memory for what is directly seen and heard. Then, there is extra memory for what cannot be seen or heard, which is in line with expectations. A cycle of all the objects (on top of subjective intent), completes the sphere. Therefore, every location on the sphere's periphery is potentially anticipated upon, dealing with its tasks, for us making the right choices for every task. All 'what-is-sensed' as source space and 'sensing' as reflected space, plus 'knowing' as source time and 'what-is-known' as self-reflected time, could be counted by their current "here and now" of all locations, as there is co-ordination, and before there is co-incidence. This includes memory-loss and misrepresentations, with all the trials and errors, and corrections along the way. It is like functioning in a dream, of which everything anticipated upon, is still actually happening. It is a dream that becomes reality, by the mind's functioning. Copy-and-swap enters from all peripheries. The object or environment/other/reality, in 'what-is-sensed' as source space and 'what-is-known' as self-reflected time, copies words and puts them on the other side, the subject or organism/self/belief, in 'sensing' as self-reflected space and 'knowing' as source time. Co-ordinate recollection, "here" at peripheries space/content/behavior, 'what-is-sensed' as source space and 'sensing' as self-reflection, in (synchronized) construction "now" at depths time/form/consciousness, 'knowing' as source time and 'what-is-known' as self-reflected time. Co-incidence by the object, between 'what-is-sensed' as source space and 'what-is-known' as self-reflected time, and the subject, between 'knowing' as source time and 'what-is-known' as self-reflected space. Space "not here" temporalizes, while time "not now" spatializes. Behavioral content at peripheries extends by temporalizing space within-facts-between-ideas, and conscious form at depths extends by spatializing time within-ideas-between-facts. Self-reflections co-inciding with opposite sources, relate to other "theres and thens" and conducting their own "here and now". Between object and subject, the subject (group and people) has dominated and submitted the object or fact and idea. Since Post-Modernism "lost" the object, relations within-groups-between-people and within-people-between-groups have taken over relations within-facts-between-ideas and relations within-ideas-between-facts. Power and politics won from truth and ethics. Group-polarization shifts group-members opinions to extremes, straining relations within-people-between-groups into conflicts of interest, for group relations in the end do translate to the individual. As long as the group, or group-leader, can determine the outcome, the individual can no longer fit truth and ethics together. Narratives can treat the same facts as different, and/or different facts as the same, twisted to fit the ideas and to reduce any cognitive dissonance (Festinger 1962). Changing facts ignores people's innocence or guilt, induces dissociative disorders as derealization or depersonalization (Dell and O'Neill 2009), affects independent individuals and dependent collectives, as socioses (Van den Berg 1956). In the end, relations should not put strain on the independent individual. Recollection and construction transform space/content/behavior at the peripheries of their spheres, to- and from time/form/consciousness at their depths, through temporalizing space and spatializing time, content-shaping-form and form-shaping-content, and behavior internalizing as consciousness and consciousness externalizing as behavior. Between the peripheries and the depths of the spheres, extensions copy-and-swap normativity, as they encounter the same process in the opposite direction. The co-incided spheres, in the object, 'what-is-sensed' as source space and 'what-is-known' as reflected time, are as in the subject, 'sensing' as reflected space and 'knowing' as source time. Co-incidence allows in recollection material facts or space/content/behavior and in construction immaterial ideas or time/form/consciousness, to be spatiotemporally identical (leaving out material- and immaterial aspects). Recollection intrapolated facts, and construction extrapolated ideas, for re-allocating, in recollection, relations within-facts-between-ideas, and in construction, relations within-ideas-between-facts, to copy-and-swap extensions for the states, stages, and phases. Sensibility after-the-fact, or 'synthetic a posteriori', synthesizes facts, as understanding before-the-fact, or 'analytic a priori', analyzes ideas (Kant 1781). Relations in space/content/behavior, recollected from peripheries to depths, or from past (after-the-fact), through the present, marked them within-facts-between-ideas. Relations in time/form/consciousness, constructed from depths to peripheries, or from future (before-the-fact) through the present, implied relations within-ideas-between-facts. In recollection, 'what-is-sensed' as source space and 'sensing' as self-reflection within-facts-between-ideas, as well as in construction, 'knowing' as source time and 'what-is-known' as self-reflection within-ideas-between-facts, celebrate truth and ethics, to change ideas to fit the facts, by open and dynamic dualism, in Functional Structuralism (Dooyeweerd 1935, Sanders 1976) and the "movement of the true growth of truth" (Bergson 1922). Within-groups-between-people and within-people-between-groups celebrate power and politics, changing facts to fit ideas, dogmatically adjusting narratives in closed and static monism, in Structural Functionalism (Parsons 1975). Inter-subjectivity in Kant's modern philosophical dualism was based on recognition of the same object, between subjects, to which each of them referred, whereas in Hegel's post-modern philosophical monism, inter-subjectivity was to be based on, hopefully reciprocal, 're-cognition' of another subject's cognition, by disregarding the primary significance of the object and objective truth, or only assigning a utilitarian role to it. Independent individual people who were intrinsically motivated by truth and ethics, for seeking independent confirmation, from the facts ('what-is-sensed'), for their ideas ('what-is-known'), to keep them honest, may be extrinsically motivated by power and politics, to avoid dependent rejection from the group, by dependent confirmation of friends, using internalism, favoritism, nepotism and/or cronyism, and independent rejection of enemies, by using group-polarization and extremism within-groups-between-people, producing bias and straining relations within-people-between-groups, to keep them loyal. Dissociation from the object's reality is impossible in the former, while it is widely applicable and accepted in the latter (Lawlor 2011). Recognition of the same object, and 're-cognition' of the same subject, either includes or excludes the object. Kant called the object the 'noumenon', literally 'unnamable thing-in-itself', by which he has not implied that the object was dispensable. It does establish inter-subjectivity between subjects referring to it, if and when 'sensing' the object ('what-is-sensed') by the subjects through independent rational-, emotional-, and/or compassionate confirmation, proves that 'knowing what-is-known' is true. Hegel was impressed by Kant, notwithstanding the fact that he opposed him, after his work was published, to slice modern philosophical dualism in half and only keep the half of post-modern philosophical monism. The other half was wasted. To Hegel, the object was irrelevant and objective knowledge impossible. The 'unnamable thing-in-itself' was not opaque, since the object was the subject itself, he claimed, radically opposing Kant. Selective 're-cognition' develops a hierarchy of subjects. If facts do not fit, power and politics will force them to 're-cognize' the ideas, even when it is “too bad for the facts”, Hegel said to a reporter, at a conferance in 1801. The concept of inter-subjectivity, in Hegel's interpretation instead of Kant's, has led to the perception of social- and cultural reality as social constructs (Schütz 1945, Berger and Luckman 1966). Structural Functionalism does not insist on objective, independent confirmation. Power and politics change individuals' seeking independent confirmation, into group members' avoiding dependent rejection, for fear of excommunication and homelessness, requiring dependent confirmation of friends (cronyism) and independent rejection of enemies (prejudice). Facts are changed to make them fit the narrative, instead of altering ideas. Different facts treated as the same, apparently confirming each other independently, may still be appreciated, or when the same facts are treated as different, the lack of this appearance of independent confirmation may still please the manipulator. For example, behavioral contagion (Wheeler 1966) may easily be misinterpreted as independent confirmation between independent individuals, one has all the goodness, and the other has all the appearance of it. Democracy based on this principle, while it is practically conspicuous by its absence. Co-incidence feeds back form or content to its opposite source by the source's self-reflection. 'Knowing' as source time feeds form and constructed ideas to 'what-is-sensed' as source space, by 'what-is-known' as self-reflected time. 'What-is-sensed' as source space feeds content and recollected facts to 'knowing' as source time, by 'sensing' as self-reflected space. 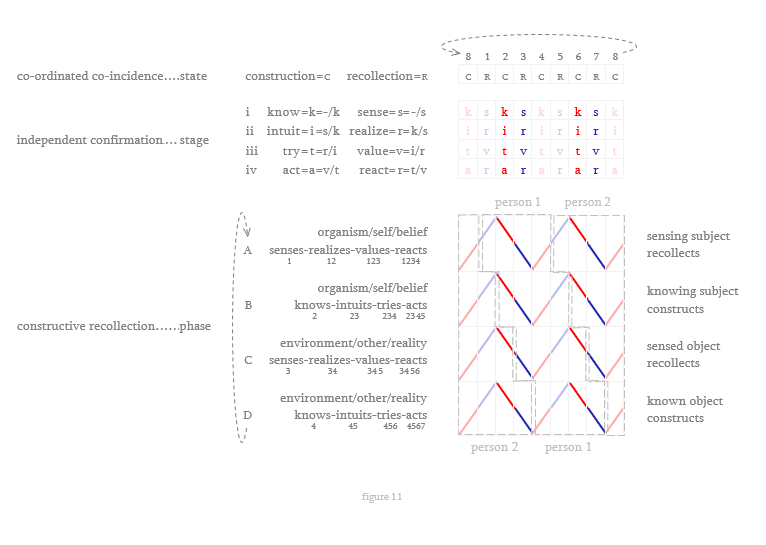 If and when co-incidence is independent confirmation, copy-and-swap realigns sources and self-reflections to feed forward positively verified content and negatively falsified form. Trusted, expected, presumed, predicted, believed and/or intended sensibility before-the-fact and independently confirmed rational-, emotional- and/or compassionate feedback, forwarded to- and from time/form/consciousness at depths, across space/content/behavior at peripheries, from 'knowing' as source time, to 'what-is-sensed' as source space, and 'what-is-known' as self-reflected time, to 'sensing' as self-reflected space. Behavior internalizing as consciousness frees 'what-is-known' before-the-fact as 'sensing' after-the-fact. Consciousness externalizing as behavior frees 'knowing' before-the-fact as 'what-is-sensed' after-the-fact. Intrinsically motivated by truth and ethics, modern dualism separates subject and object to look for recollection's externally normative spheres 'sensing' and 'what-is-sensed', which independently confirm construction's internally normative spheres 'knowing' and 'what-is-known', both in the subject between its forms ('knowing', 'sensing') and in the object between its contents ('what-is-known', 'what-is-sensed'). If and when independent confirmation is to be found, in construction, time spatializes, form-shapes-content and consciousness externalizes as behavior, whereas in recollection, space temporalizes, content-shapes-form and behavior internalizes as consciousness. By contrast, extrinsically motivated by power and politics, post-modern monism favors subjects over objects (Hegel 1807), to send roles (Boekestijn 1978) internally normative within-groups-between-people from the top, and receive them externally normative within-people-between-groups at the bottom. Dependent confirmation pays-, and reciprocally earns, its 're-cognition' to- and from friends in high places (Mulder 1973), as independent rejection disregards the out-group (Tajfel 1970). 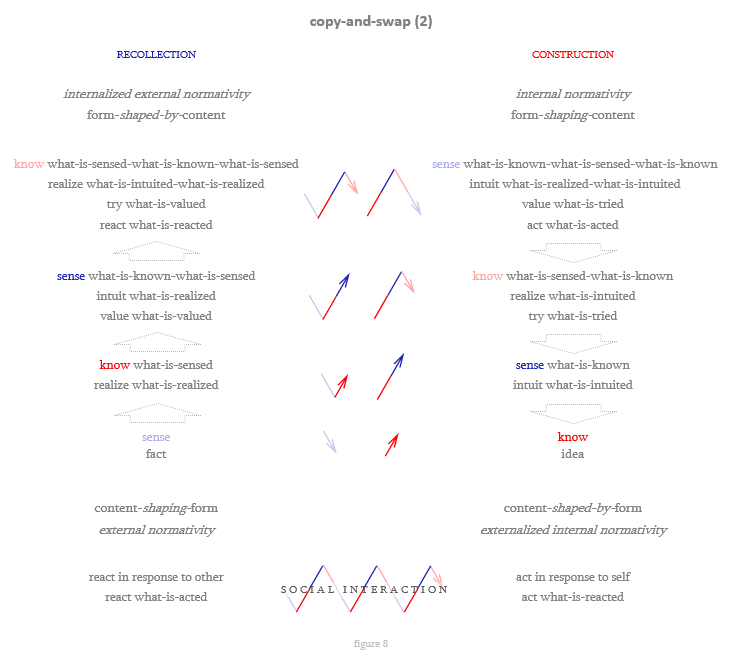 If and when sources and the opposite source's self-reflective feedback do co-incide, and sensibility independently confirms understanding, then contents ('what-is-sensed', 'what-is-known') copy-and-swap forms ('sensing', 'knowing'), to process contents and feed this subtle, complex substance of copy-and-swap forward to the next sphere. New forms reduce old forms to contents, extending the leading form and the contents linked to it, within- and between object and subject. Independent confirmation is extending recollection, from 'sensing' to 'knowing what-is-sensed' ('realizing'), across the subject's depth to 'sensing what-is-known-what-is-sensed' ('valuing'), across the peripheries between subject and object to 'knowing what-is-sensed-what-is-known-what-is-sensed' ('reacting'), and separately the object's depth extending construction from 'knowing' to 'sensing what-is-known' ('intuiting'), across peripheries between subject and object to 'knowing what-is-sensed-what-is-known' ('trying'), across the object's depth to 'sensing what-is-known-what-is-sensed-what-is-known' ('acting'), and across peripheries between object and subject, re-entering the subject. Facts ('what-is-sensed') and positively verified ideas ('what-is-known'), like white swans and "white swans" are proexamples (Corcoran 2005). Independently confirmed, positively verified objective content ('what-is-sensed', 'what-is-known'), and/or negatively falsified subjective form ('sensing', 'knowing'), makes content copy-and-swap form, 'realize' ('knowing what-is-sensed') white swans, 'intuit' ('sensing what-is-known') "white swans". Positively falsified 'intuited' counterexamples (black swans) are not 'realized'. Proexamples copy-and-swap content ('what-is-known-what-is-sensed', 'what-is-realized'; 'what-is-sensed-what-is-known', 'what-is-intuited'), by form ('realize'; 'intuit'), 'value' ('intuit what-is-realized') and 'try' ('realize what-is-intuited'). Positively falsified 'tried' counterexamples aren't 'valued'. Proexamples copy-and-swap content ('what-is-sensed-what-is-known-what-is-sensed', 'what-is-valued'; 'what-is-known-what-is-sensed-what-is-known', 'what-is-tried'), by form ('value'; 'try'), 'react' ('try what-is-valued') and 'act' ('value what-is-tried'). Counterexamples positively verify and proexamples negatively falsify the validity of 'sense' for 'know'. If and when a sensed object positively verifies a known object for reliability, and/or sensing negatively falsifies knowing for validity, then 'sensing what-is-sensed' independently confirms 'knowing what-is-known'. If contents copy-and-swap forms, 'knowing what-is-known' is 'sensing what-is-known' ('intuiting what-is-intuited') and 'sensing what-is-sensed' is 'knowing what-is-sensed' ('realizing what-is-realized'). If 'what-is-realized' positively verifies 'what-is-intuited' for reliability, and/or 'realizing' does negatively falsify 'intuiting' for validity, then 'realizing what-is-realized' independently confirms 'intuiting what-is-intuited'. 'Intuiting what-is-intuited' becomes 'realizing what-is-intuited' ('trying what-is-tried' or 'knowing what-is-sensed' plus 'sensing what-is-known' as 'knowing what-is-sensed-what-is-known') as 'realizing what-is-realized' becomes 'intuiting what-is-realized' ('valuing what-is-valued' or 'sensing what-is-known' plus 'knowing what-is-sensed' as 'sensing what-is-known-what-is-sensed'). In like manner, 'valuing' and 'trying' emerge as 'trying what-is-valued' ('reacting what-is-reacted') to guide 'valuing what-is-tried' ('acting what-is-acted'). In recollection, 'reacting' is 'trying what-is-valued', of which 'valuing' is 'intuiting what-is-realized', of which 'realizing' is 'knowing what-is-sensed'. In construction, 'acting' is 'valuing what-is-tried', of which 'trying' is 'realizing what-is-intuited', of which 'intuiting' is 'sensing what-is-known'. Recollection allows construction at all stages of independent confirmation, for the subject or organism/self/belief, from the depths of 'knowing' as source time and 'sensing' as self-reflected space, to process the object or environment/other/reality, from the peripheries of 'what-is-sensed' as source space and 'what-is-known' as self-reflected time. By positive verification, time/form/consciousness, constructed into space/content/behavior at the peripheries of the spheres in the object, is allowed by source space/content/behavior (to 'know') 'what-is-known' as self-reflected time. By negative falsification, space/content/behavior recollected into time/form/consciousness at the depths of the spheres in the subject, allows source time/form/consciousness to 'know' ('what-is-known'). A 'definition of the situation' (Thomas 1928) preserves 'what-is-known' as self-reflected time. In modern dualism, at the upper stage of independent confirmation, recollection and construction are in direct contact with social reality and might be socially interacting as self and other. The self-reflections between subject and object in social interaction, are self-representations (the object may be transparent). The object's source self-reflects in the subject, from the peripheries of the spheres of recollection in space/content/behavior, like the subject's source self-reflects in the object, from the depths of the spheres of construction in time/form/consciousness. Thus, truth and ethics, in construction, intrinsically motivate subjects, to seek and find independent confirmation between its consciousness externalized as behavior, including form-shaping-content, as in recollection as well, spatializing time, and the other's behavior internalized as consciousness, including content-shaping-form, and temporalizing space. The one represents himself in the other, and the other represents himself in the one, by independent rational-, emotional- and/or compassionate confirmation. Independent individuals are represented even if they do not presently represent themselves. After religion and philosophy, physical science appears dualistic, as spatiotemporality can be either ontologically material or epistemologically immaterial. 'Knowing what-is-known' before-the-fact ought to be independently confirmed, in whatever way, rationally, emotionally and/or compassionately, by 'sensing what-is-sensed' after-the-fact. If and when that is the goal, truth and ethics are on our side. However, seeking independent confirmation often is underhandedly replaced by avoiding dependent rejection. Then, instead of truth and ethics, power and politics control social order. Politics cumulate power, to 'bulldoze' all the facts, and 'prove' or self-fulfill an idea, which should be trusted, expected, presumed, predicted, believed or intended, and be independently confirmed by the facts. Social interaction between the sensing- and knowing subject on the one hand, and the sensed- and known object on the other ('what-is-sensed', 'what-is-known'), in [3a] science, [3b] justice, and [3c] journalism. This is about how independent confirmation separates science from fiction, justice to discriminate good from bad, and journalism to publish how it influences the society. Sometimes, science, justice, and journalism, may all be wrong. Here is an exemplary case study. One criminal is caught and an innocent one is captured with him. Science called this "Marketing and Seduction" (Deighton and Greyson 1995), justice convicted with 27 and 2.5 years in prison, and journalism sent out opinions convicting them all over the world. Seduction is mail-fraud, or the stealing of people's money, after they had promised them "paradise on earth". Now, what happened to the junior venture, who got 2.5 years. She was 21 in 1985 when she knocked on the door of what she thought was a bookstore. She did not know it had, since 1966, held by coverup, a mail-fraud with thousands of men who were searching "goddesses". The marketing was done by the first venture of the store, a 59 year old men. He did mention the "back-business" to his wife and each of his employees, who did all get immunity. Not so with the junior venture. She was not told anything and kept believing he was innocent. By the time the FBI came in, he had held a gun to her head and kept demanding things. She had Post Traumatic Stress Disorder and Dissociative Identity Disorder. Facts-relate-ideas in recollection, while ideas-relate-facts in construction. 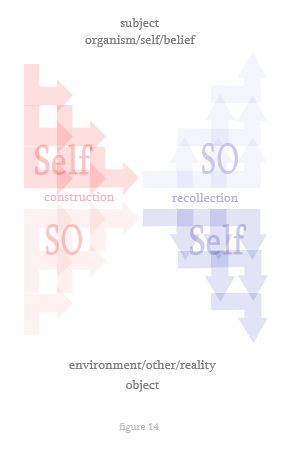 If and when recollection independently confirms construction, relations within-facts-between-ideas and relations within-ideas-between-facts are the same, which co-incides temporalization of space and spatialization of time, content-shaping-form and form-shaping-content, behavior internalizing as consciousness and consciousness externalizing as behavior. Independent confirmation makes contents (facts or 'what-is-sensed', ideas or 'what-is-known') copy-and-swap forms, to process old and new contents, extending them before they are dissolved in interaction. Recollection needs to independently confirm construction at successive stages, or 'sensing/realizing/valuing/reacting' in recollection, and 'knowing/intuiting/trying/acting' in construction, as new forms, copied-and-swapped by forms, replacing old forms, reduced to contents, and added to preexisting old contents. Swapping forms alternates states of recollection and construction, at all stages of independent confirmation. Thus, form-plus-contents emerge into extending and evolving substances, both in recollection and construction. By social interaction between object and subject, parties reflect their own source in the other, and have the other's source reflected in themselves. If and when independent confirmation is found, then contents ('what-is-sensed', 'what-is-known') copy-and-swap forms ('sensing', 'knowing'), to convey source substance (form-plus-contents) from one's depths, through both peripheries, the other's depths, and back through both peripheries. Independent confirmation is repeated on the other side, to continue the social interaction. Conveyed is independently confirmed rational-, emotional-, and/or compassionate substance, positively verified in space/content/behavior for reliability and/or negatively falsified in time/form/consciousness for validity. One's recollection, independently confirming one's construction, extends to the other's construction, when co-ordination between one's construction and the other's recollection is existing. Consciousness externalizes as behavior in the one, while behavior internalizes as consciousness in the other (alongside form-shaping-content and content-shaping-form, spatializing time and temporalizing space), to convey contents. Contents are conveyed from one source to the other, by the sources' self-reflections, seeking co-incidence and independent confirmation, as they go around their source's peripheries, recollecting facts or constructing ideas, temporalizing space or spatializing time, shaping- or shaped by form, and internalizing behavior or externalizing consciousness. Trusted, expected, presumed, predicted, believed and intended 'action' before-the-fact, is freed after-the-fact, if and when one's 'reaction' to the other's 'action' independently confirms it, rationally, emotionally, and/or compassionately. One 'senses/realizes/values/reacts', what the other 'knows/intuits/tries/acts', while the other 'senses/realizes/values/reacts' what the one 'knows/intuits/tries/acts'. Content extends to 'knowing [by the other] what-is-sensed [by the other] what-is-known [by the self'] what-is-sensed [by the self]', or 'what-is-reacted', in recollection – and to 'sensing [by the self] what-is-known [by the other] what-is-sensed [by the other] what-is-known [by the self]', or 'what-is-acted', in construction. 'Reacting' to the other's 'action' and 'acting' in response to one's own 'reaction' are social cycles. In one's sphere of recollection, from periphery to depth, 'what-is-sensed' is temporalizing space, content-shaping-form, and behavior internalizing as consciousness, while its substance extends by contents' copy-and-swap of forms, a stage at a time, from subliminal 'sensing what-is-sensed' to interactive 'reacting what-is-reacted'. 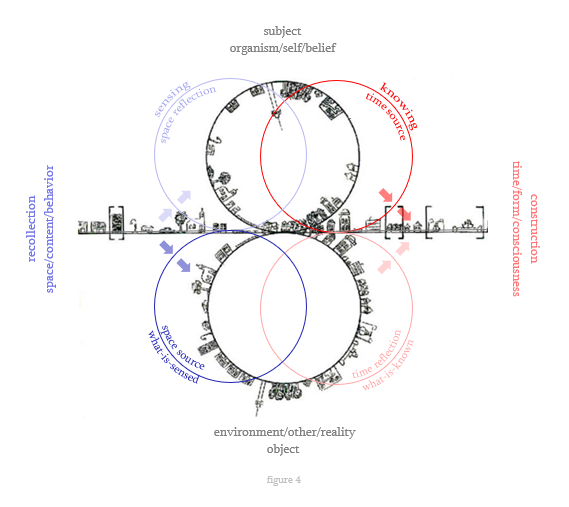 In one's sphere of construction, from depth to periphery, 'what-is-known' is spatializing time, form-shaping-content and consciousness externalizing as behavior, while its substance extends by contents' copy-and-swap of forms, a stage at a time, from supraliminal 'knowing what-is-known' to interactive 'acting what-is-acted'. As substance extends, alternatingly by 'sensing' and 'knowing', to be reduced to 'what-is-sensed' and 'what-is-known' at the next stage, it meanders between subject and object, at the depths of the spheres, crossing peripheries. Once a stage reaches social interaction, it fulfills its goals, by conveying valid and reliable knowledge. The social cycle continues, held by both the subject's recollection and the object's construction, synchronized by the same states at a different position in all phases, for each of the parties. If and when sources and self-reflections of their opposite sources co-incide, 'what-is-sensed' and 'what-is-known' copy-and-swap 'sensing' and 'knowing', or space/content/behavior at the peripheries exchange time/form/consciousness at the depths of their spheres. 'Knowing what-is-sensed' extends substance processed in recollection, as 'sensing what-is-known' extends substance processed in construction. Copy-and-swap forms alternate, or 'sensing' and 'knowing', although the processing direction, in recollection from periphery to depth of the sphere, and in construction from depth to periphery, does never change, and remains recollective or constructive. Substances in recollection and construction consist of forms ('sensing', 'knowing') extending contents ('what-is-sensed-what-is-known-what-is etc'), within- and between the spheres, in subject and object, crossing depths, and in between, crossing peripheries. Thus, recollection extends 'sensing' to 'knowing what-is-sensed-what-is-known-what-is-sensed' ('reacting what-is-reacted'), as construction extends 'knowing' to 'sensing what-is-known-what-is-sensed-what-is-known' ('acting what-is-acted'). Each cycle of constructive recollection happens on two sides, one for each person. Both people see all transformations, both of themselves and of the other. One transformation begins with construction and recollection on their side. Then how is the transformation from their construction, to be picked up by the other's recollection? And how does the other construct with its recollection? And finally, how does the current recollection pick up the construction from the other? Those are the four phases of stage one. Then the four phases of stage two start, beginning from the other person. A phase gets to another level, the first one out of four. At the highest stage, 'sensing' and 'knowing' have become 'reacting' and 'acting'. One person can still be in phase one and the other in phase four, depending on one's experience with it. Finally, there is an order in the states of initiatives, one is constructing and the other is recollecting. First, the sensing subject recollects, then the knowing subject constructs, and the sensed object recollects, finally the known object constructs, and each state jumps ahead one state, with the next person in the exchange of social interaction. Individual- or collective recognition is integral to social reality. Kant's 'Categorical Imperative', instructing the autonomous individual to “act only according to that maxim by which you can at the same time will that it should become a universal law” (Kant 1785), is equal to "an objective, rationally necessary and unconditional principle that we must always follow, despite any natural desires or inclinations we may have to the contrary” (Johnson 2016). 'Sensibility after-the-fact' which independently confirms 'understanding before-the-fact', establishes inter-subjectivity between subjects referring to-, and recognizing the object. This comprises all trusted, expected, presumed, predicted, believed and intended 'sensibility before-the-fact', or the 'synthetic apriori'. Though, underhandedly, literal 're-cognition' of another subject took over, dependently confirming friends and independently rejecting enemies, "to boost one's self-consciousness", "to go into the world and lose oneself", and not "to go into oneself and lose the world" (Hegel 1807). Thus, power and politics, 're-cognizing' through the subject, ended truth and ethics, recognizing through the object. Power and politics change facts ('what-is-sensed'), to fit the ideas, while truth and ethics change ideas ('what-is-known'), to fit the facts. Facts relate ideas (within-facts-between-ideas) in recollection, as ideas relate facts (within-ideas-between-facts) in construction, by the same set of relations. Facts used in one idea, being reused in another, entangle relations within-facts-between-ideas, if the same fact is treated as different, or different facts as the same, corrupting independent confirmation or objective truth for independent individuals. Groups relate people (within-groups-between-people) as people relate groups (within-people-between-groups), by the same set of relations. Belonging to different groups entangles relations, growing into conflicts of interest by group-polarization. Thus, power and politics motivate extrinsically to avoid dependent rejection or the threat of being excommunicated or made homeless, being loyal, while truth and ethics motivate intrinsically to seek independent rational-, emotional- and/or compassionate confirmation between existing construction within-ideas-between-facts and recollection within-facts-between-ideas, being honest. Truth is understanding, 'knowing now what-is-known', or ideas before-the-fact in construction, proven by the independent confirmation from sensibility, 'sensing here what-is-sensed', or facts after-the-fact in recollection, rationally, emotionally, and/or compassionately. In the organism/self/belief, sensing negatively falsifies knowing, for validity, unable to disprove it, and in the environment/other/reality, 'what-is-sensed' positively verifies 'what-is-known', for reliability, able to prove it. Power and politics can effortlessly turn 'seeking independent confirmation' into 'avoiding dependent rejection', between the sensing- and the knowing organism/self/belief, and/or between the known- and the sensed environment/other/reality, underhandedly and subtly, giving up on one's unique identity while giving in to identity politics. This establishes monistic dialectics, forcing people to 'loyally' take sides (or leave the party) and dependently confirm the unavoidable 'friends' and independently reject the unavoidable 'enemies', of their own or of their leader's, to strip away peoples' personal identities and dress them up, in the uniforms of closed- and static groups. Consciously or not, power and politics seek loyalty, while truth and ethics seek honesty. Power and politics make us (inter) dependent, if we avoid dependent rejection from the group, by excommunication or homelessness. Independent rejection of (the leader's) enemies and/or dependent confirmation of friends, out of loyalty, triggers selective reciprocity and possible access to privilege. Meanwhile, truth and ethics need independence, waiting for reality to independently confirm beliefs, rationally, emotionally, and/or compassionately. The object establishes both inter-subjectivity between subjects referring to it, and independent confirmation strengthening them as honest and independent individuals, conditioned just by the truth. Independence cannot do without dualism, which is difficult to apply in personal- and social settings, as power and politics invariably turn 'seeking independent confirmation' into 'avoiding dependent rejection'. Truth and ethics change the ideas to fit the facts, while power and politics change the facts to fit the ideas. Thus, relations entangled within-ideas-between-facts transpire within-facts-between-ideas, as stress and dissociation. Our worlds are cut up and mixed. Post-Modernism upheld immanently dialectic monism using power and politics, after the Kantian era into the French Revolution, fifty years later followed by the European Revolutions. Modernism though, upheld independent individual dualism or truth and ethics, before those revolutions. If circumscribed as dialectics, monism looks like dualism. However, monism assumes that we are all (inter) dependent subgroups or -individuals, competing for our own dominance and every others' submission (Hegel 1807, Marx 1867, Nietzsche 1901). 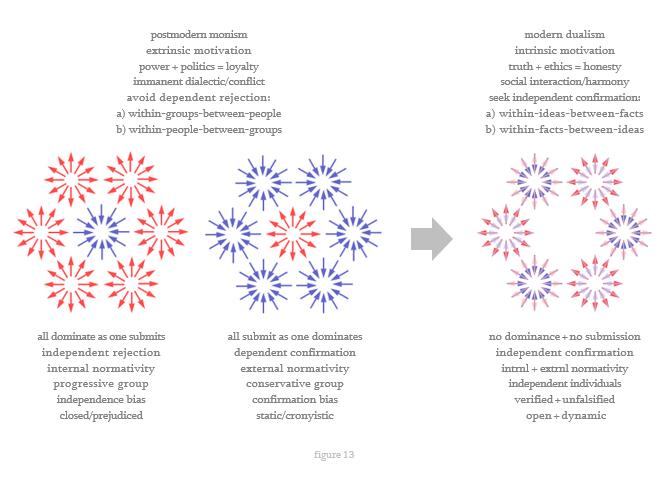 Monistic (inter) dependency leads to 're-cognition', bypassing truth and provoking group-polarization or extremism, by dependent confirmation of one's own group, and independent rejection of others'. Dualistic independency assumes that there are two sources instead of one, interacting through any two individuals, object and subject, or other and self, who seek independent confirmation, to stay on track of truth. Thus, dualistic (inter) dependency between autonomous individuals seeks independent rational-, emotional-, and/or compassionate confirmation, both from- and for other and self. The main differences between the worlds of post-modern monism and modern dualism, is where they collide as well. In the former, normative rationality (Habermas 1982, 1991) is sent down the social hierarchy of monism, internal for leaders and external for followers, through power and politics. Supposedly, there is a system of checks and balances (Montesquieu 1749) which keeps the leaders under control, balancing out their powers. However, "power tends to corrupt, and absolute power corrupts absolutely" (Dalberg-Acton 1887). Therefore, truth and ethics, recognizing the object, should reclaim their position in social reality, from power and politics, 're-cognizing' only the subject. 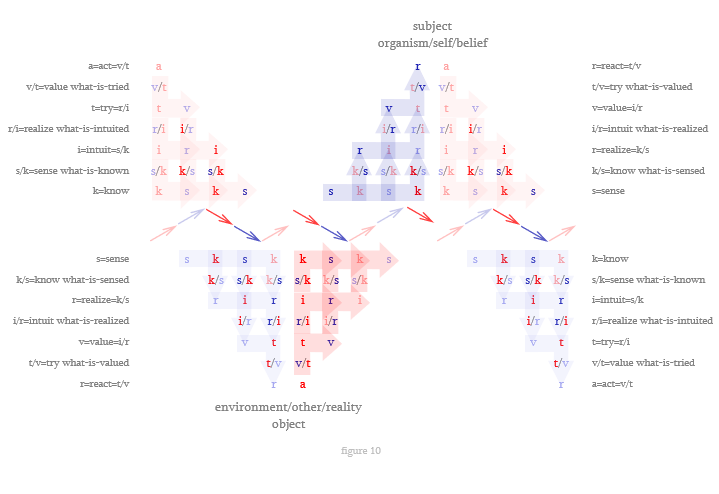 Relations within-groups-between-people, upset by group-polarization and dogmatism, discharge their tensions on (the same) relations within-people-between-groups, causing dissociation disorders between subject and object, or the organism and the environment, self and other, belief and reality, which cannot be fixed otherwise. Relations within-ideas-between-facts, in construction, independently confirmed by (the same) relations within-facts-between-ideas, can never be inapt. Power and politics create groups, held together by loyalty, as truth and ethics create independent individuals, held together by honesty. Loyalty violates truth and ethics, when it changes facts to fit the ideas, making innocence defenceless, within-groups-between-people and by group-polarization, within-people-between-groups. Honesty 'explained' as disloyalty, can no longer enable honest people to avoid dependent rejection. As the common enemy, they increase dependent confirmation between friends, independently rejected their selves. There do exist (human) angels, offering themselves to save these lost souls, independently or unnoticeably confirming their talents, for them to continue to be compatible and to compete for survival, in social reality. However, this type of independent confirmation is still going for power and politics. It offers more energy for those left to the side of society. To the businessangel, who cannot reveal his or her identity, the job is isolating, comparable to elites spoiling their protégés, though without the social status and without the celebration of power. The only thing that is left, is to hopefully viewing the person thrive. In recollection, 'what-is-sensed' as source space, self-reflects in 'sensing' as self-reflected space. In construction, 'knowing' as source time, self-reflects in 'what-is-known' as self-reflected time. As subject and object, or self and other, socially interact, they could become each other's Significant Other, next to-, although apart from, their Selves. If and when that happens, 'knowing' as source time self-reflects in 'what-is-known' as self-reflected time, or the one Significant Other, just like 'what-is-sensed' as source space self-reflects in 'sensing' as self-reflected space, or the second Significant Other. In construction, 'knowing' and 'what-is-known', and in recollection, 'sensing' and 'what-is-sensed', divide within- and between subject and object, or each within- and between themselves. The Significance of the Other eliminates the need to seek independent confirmation, as it engages entirely with sensibility before-the-fact, in which construction applies recollection, since they are the same for each of the partners, co-inciding with reality, and co-ordinating with each other or social reality, in which both of the social identities are developing as one and the same. The kind of social order, post-modern monism or modern dualism, conditions social identity. Avoiding dependent rejection makes one 're-cognize' the subject, whereas seeking independent confirmation makes one recognize the object. Social order created by monism or power and politics, motivates avoiding dependent rejection, by dependently confirming 'friends' and independently rejecting 'enemies'. Hierarchy cites identity, as (inter) dependent upon 'friends' rejecting-, and rejected by the 'enemies'. Social order created by dualism or truth and ethics, motivates seeking independent confirmation, by mutual strengthening of independent individuals' social identities, because the object establishes inter-subjectivity between them. Subjects are inter-subjectively 're-cognized' in monism, extrinsically controlled by power and politics, to condition reflexes of the subjects, classically and/or operantly (Pavlov 1910, Skinner 1930), aiming to avoid dependent rejection, in Structural Functionalism, while subjects inter-subjectively recognize the object in dualism, intrinsically motivated by truth and ethics, seeking independent confirmation, in Functional Structuralism. Between modern dualism or truth and ethics on the one hand, and post-modern monism or power and politics on the other, the relation between Self and Significant Other is critical for the kind of social order that will develop from it. When there is competition valued at-, or above, the comparison level, relations grow tense (Thibaut and Kelley 1959). Then, the Self and Significant Other will seek each other's independent confirmation, or will they avoid each other's dependent rejection, dependently confirming each other while independently rejecting their competition? The former relies on truth and ethics of relations within-facts-between-ideas and within-ideas-between-facts, not being entangled, as facts are used in one idea and reused in the other, to establish objective or inter-subjective truth between the subjects, independently referring to them, typical of modern dualism. The latter relies on power and politics of relations within-groups-between-people, as well as within-people-between-groups, by means of group-polarization. All subjective cultural belief-systems protect themselves against a real, objective world, typical of post-modern monism. In monism, partnerships or relationships, based on loyalty within-groups-between-people, 're-cognizing' the subject, grow problematic within-people-between-groups, if group-polarization calls for facts to be changed, to fit the ideas. When people depend on each other, they avoid dependent rejection by dependent confirmation of 'friends' and independent rejection of 'enemies' out of 'loyalty', being 're-cognized' as a subject. Loyalty and dependency between people are naturally followed by arguments, questioning who depends more on whom, in the process of which apparently independent leaders eventuate, who depend on their followers as much as the favor is reciprocal. Therefore, true independence only leads to independent confirmation or truth. In dualism, based on honesty within-facts-between-ideas, recognizing the object, they cannot grow problematic within-ideas-between-facts, if ideas are changed to fit the facts. When people are independent individuals, seeking independent rational-, emotional-, and/or compassionate confirmation, the object to which they refer as their environment/other/reality, is recognized, for truth and ethics. In between monism and dualism, or avoiding dependent rejection and seeking independent confirmation, there is one social compassion that requires depersonalization, from the 'businessangels'. Seeking independent confirmation is reversed into providing dependent confirmation for the ones who need it, who are the victims of monism. Without taking any credits or disclosing one's identity, the victims who were independently rejected, as others were dependently confirmed, are provided strength by businessangels independently confirming them, to avoid dependent rejection. The power and politics may be comparable, like positive discrimination, affirmative action, or identity politics. However, these are also power and politics taking care of 'their own'. This is a challenge for the businessangels whose motives are with fortitude, confirming them independently, who have a difficult time proving their innocence when monistic power and politics change the facts to fit their ideas, or their narrative, to do justice helping those who were neglected. These are the people we referred to before, who are correcting what seemed unjustified, at their own cost. All people are related, by dependent confirmation (cronyism), receiving- and returning favors, or by seeking independent rational-, emotional-, and/or compassionate confirmation, both from- and for the other. If the schemas are mixed, monistic power and politics extrinsically and opportunistically motivate dependent 'reaction-and-action' within groups, by changing facts to fit the ideas or the narrative. Still, dualistic truth and ethics intrinsically motivate independent 'action-and-reaction' between independent individuals, if and when their after-the-fact recollection independently confirms their before-the-fact construction, by changing ideas to fit the facts. If facts are changed to fit the ideas or the narrative, then changing ideas to fit the facts, has no use at all. Intrinsically or extrinsically motivated reactions, in response to extrinsically or intrinsically motivated actions, are hardly comprihensible or at the very least they cannot be positively verified for reliability and they cannot be negatively falsified for validity. One obvious error is extrinsically motivated action, considering what they do not view as such, independent confirmation, as a favor to be repaid. In recollection, 'what-is-sensed' as source space, and in construction, 'what-is-known' as self-reflected time, copy-and-swap forms, if and when the spheres co-incide, of the subject as well as of the object, in space/content/behavior at the peripheries and in time/form/consciousness at the depths, by independent confirmation. Within-facts-between-ideas, 'knowing what-is-sensed', 'intuiting what-is-realized' and 'trying what-is-valued' are recollected facts-relating-ideas or ideas reusing facts as linking-pins. Within-ideas-between-facts, 'sensing what-is-known', 'realizing what-is-intuited' and 'valuing what-is-tried' are constructive ideas-relating-facts. Relations develop meaningful, expanding networks, as facts (or objects) establish inter-subjectivity between ideas (or subjects) referring to them, for independent confirmation. As power and politics motivate to avoid dependent rejection within-groups-between-people and by group-polarization, within-people-between-groups, truth and ethics motivate to seek independent confirmation, instead. Recollection within-facts-between-ideas, to independently confirm construction within-ideas-between-facts, is obstructed. Modern philosophical, open- and dynamic dualism could prevent post-modern philosophical, closed- and static monism, of which proponents polarize their opinions, through power and politics, to create intolerant majorities. Minority influence is strong, if consistent for a long time, not dividing the majority’s attention (Moscovici 1974). Relations within-facts-between-ideas or within-people-between-groups should not entangle, which does happen if ideas treat different facts as the same, untruthfully finding independent confirmation, or treat the same fact as different, untruthfully not finding independent confirmation. For example, asking how ideas categorically demand their own realization, in a closed and static approach following the 'Categorical Imperative' (Lawlor and Moulard 2016), Bergson was interpreted as if he criticized Kant. Stating that "by re-establishing the duality, the difficulties vanish", Bergson (1932) accentuated seeking independent confirmation between the two sources, in "duality of origin" (p.79). His post-modern biographers dubiously called it, from a single-source monistic view, "but two complementary manifestations of life". Notions of rationality, emotion, and compassion, are recollected facts and constructed ideas, co-inciding and independently confirming each other for space/content/behavior to copy-and-swap time/form/consciousness. Staying truthful, recollection within-facts-between-ideas has to independently confirm construction within-ideas-between-facts, unblocked by group-polarization. As within-groups-between-people, shifting personal opinions to a dominant extreme of concentrated power and politics, unloads within-people-between-groups. Independent rational-, emotional-, and/or compassionate confirmation creates meaningful networks of logical-, chronological-, and/or associative relations within-ideas-between-facts. Within-facts-between-ideas, facts can be reused as linking-pin objects. Reusing the facts to link the ideas should not change the meaning of these networks, calling the same facts different, or different facts the same, driven by power and politics. Once relations entangle, no truth proves one's innocence, facts isolate from their meaning, and people isolate from their identity, stoking up traumatic stress, as well as tormenting dissociation. Underhand inversion of 'seeking independent confirmation' into 'avoiding dependent rejection' by the adversary of modern philosophical dualism, post-modern philosophical monism, is a celebration of power, rather than truth. To resume modern dualism, its antecedents were traced to Kant and physics, in the concept of 'spatiotemporality', as temporal understanding is sanctioned by spatial sensibility through the co-ordinated co-incidence of space and time, processed by the subject and/or the object. The consequents of dualism have been explored in a model of social interaction, constituting co-ordinated co-incidence, independent rational-, emotional, and/or compassionate confirmation, and constructive recollection within- and between people. Truth and ethics at the level of the independent individual, who changes ideas to fit the facts in open- and dynamic dualism, needs to replace power and politics at the level of the dependent collective, in which group-polarization changes facts to fit the ideas of closed- and static monism, and results in the traumatizing impossibility to prove innocence or guilt, which in turn leads to dissociation and loss of identity. Berger, P.L. ; Luckmann, T. (1966). "The Social Construction of Reality”. New York: Anchor Books. Bergson, H. (1922). "The Retrograde Movement of the True Growth of Truth". In: "Creative Evolution". New York: Henry Holt and Company. Bergson, H. (1932). "The Two Sources of Morality and Religion". London: Macmillan and Company Limited. Boekestijn, C. (1978). "De psychologie van relaties tussen groepen". In: Jaspars, J.M.F. ; Vlist, R. v.d. "Sociale Psychologie in Nederland". Meppel: Boom. Corcoran, J. (2005). "Counterexamples and Proexamples". Bulletin of Symbolic Logic 11, 460. Dalberg-Acton, J.E.E. (1887). In Figgis, J.N. ; Laurence, R.V. "Historical Essays and Studies". London: Macmillan, 1907. Deighton, J.; Grayson, K. (1995). "Marketing and Seduction: Building Exchange Relationships by Managing Social Consensus", in "Journal of Consumer Research, Inc", Vol 25. Dell, P.F. ; O’Neil, J.A. (2009). "Dissociation and the Dissociative Disorders: DSM-V and Beyond". New York: Routledge: 750. Derrida, J. (1992). "Force of Law”. In: D. Cornell, M. Rosenfeld, and D. G. Carlson "Deconstruction and the Possibility of Justice". New York: Routledge. Descartes, R. (1644). "The Principles of Philosophy". Dooyeweerd, H. (1935-36). "The Philosophy of the Law-Idea". Amsterdam: H.J. Paris. Festinger, L. (1962). "Cognitive dissonance". Scientific American, 207(4), 93–107. Habermas, J. (1982). "A reply to my critics". In: Thompson, J.B.; Held, D. "Habermas: Critical Debates". London: Macmillan. Habermas, J. (1991). "A reply". In: Honneth, A.; Joas, H. "Communicative Action". Cambridge: Polity Press. Harré, R.; Secord, P.F. (1972). "The Explanation of Social Behavior". Oxford: Basil Blackwell. Hegel, G.W.F. (1807). "Phänomenologie des Geistes". Bamberg und Würzburg: J.A. Goebhardt. Heidegger, M. (1959). "Introduction to Metaphysics". New Haven: Yale University Press. Johnson, R.N; Cureton, A (2016). "Kant’s Moral Philosophy". Stanford Encyclopedia of Philosophy. Kant, I. (1781). "Kritik der reinen Vernunft". Riga: J.F. Hartknoch. Kant, I. (1785). "Grundlegung zur Metaphysik der Sitten". Riga: J.F. Hartknoch. Kant, I. (1790). "Kritik der Urteilskraft". Berlin: Bey F. T. Lagarde. Lawlor, L. (2011). "Jacques Derrida". Stanford Encyclopedia of Philosophy. Lawlor, L.; Moulard, V. (2016). "Henri Bergson". Stanford Encyclopedia of Philosophy. Marx, K. (1859). "Zur Kritik der Politischen Ökonomie". Wien: Alfred Hölder. Marx, K. (1867). "Das Kapital". Berlin: Verlag von Otto Meisner. Meertens, R.W. (1980). "Groepspolarisatie". Deventer: Van Loghum Slaterus. Meertens, R.W. ; Prins, Y.R.A. ; Doosje, B. (2006). "In iedereen schuilt een terrorist. Een sociaal-psychologische analyse van terroristische sekten en aanslagen." Schiedam: Scriptum. Montesquieu, C.L. (1749). "De l'Esprit des Loix". Geneve: Barillot & fils. Moscovici, S.; Zavalloni, M. (1969). "The group as a polarizer of attitudes". Journal of Personality and Social Psychology 12 (2): 125–135. Moscovici, S.; Nemeth, C. (1974). "Social psychology: Classic and contemporary integrations." Oxford: Rand Mcnally. Mulder, M.; Veen, P.; Rodenburg, C.; Frenken, J.; Tielens, H. (1973). "The power distance reduction hypothesis on a level of reality". 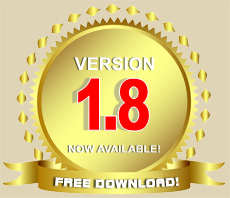 Journal of Experimental Social Psychology 9 (2): 87–96. Nietzsche, F. (1882). "Die fröhliche Wissenschaft". Leipzig: Verlag von E. W. Fritzsch. Nietzsche, F. (1901). "Der Wille zur Macht”. Leipzig: C. G. Naumann. Parsons, T. (1975). "The Present Status of 'Structural-Functional' Theory in Sociology", Social Systems and The Evolution of Action Theory, New York: The Free Press. Pavlov, I.P. (1910). "The Work of the Digestive Glands". London: Charles Griffin & Company Ltd.
Rohlf, M. (2016). "Immanuel Kant". Stanford Encyclopedia of Philosophy. Sanders, C.; Eisenga, L.K.A. ; Van Rappard, J.F.H. (1976). "Inleiding in de grondslagen van de Psychologie". Deventer: Van Loghum Slaterus. Sartre, J-P. (1943). "Being and Nothingness". Paris: Gallimard. Schütz, A. (1945). "On Multiple Realities." In Philosophy and Phenomenological Research. 5: 533–576. Rhode Island: Brown University. Skinner, B.F. (1930), "On the conditions of elicitation of certain eating reflexes." Proceedings of the National Academy of Sciences, 16, 433-38. Tajfel, H. (1970). "Experiments in Intergroup Discrimination". New York: Oxford University Press. Thibaut, N.; Kelley, H. (1959). "The social psychology of groups". New York: Wiley. Thomas, W.I. ; Thomas, D.S. (1928). "The child in America: Behavior problems and programs". New York: Knopf. Wheeler, L. (1966). "Toward a theory of behavioral contagion". Psychological Review, 73(2), 179-192. Wit, H.F. de (1991). "Contemplative Psychology". Pittsburgh: Duquesne University Press. Žižek, S. (2012). "Less than Nothing: Hegel and the Shadow of Dialectical Materialism". London: Verso.